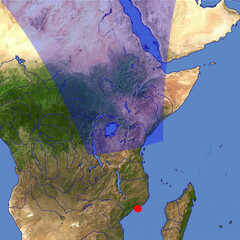 The Great African Rift Valley is a large breach in the crust of the earth where the African continent showly splits into two parts. Many lakes can be seen along the rift, among them the Lake Victoria, the largest lake of Africa. Please keep up the spirit & get on moving. Good, but not well emphasized in parts. You drew it your self, I assume. It is certainly good art. Thanks for making these images available - I am preparing for a journey to the Masai Mara and The Serengeti - your 'art' has assisted me in visualizing the terrain. The body round looking greenish brown all with blue stuff isn't anything but nothingness when combined,and defined what we falsely don't know! = ? Not life? wow....amazing....spectacular....awesome...how do you do it? im really amazed this is weird im only in sixth grade but im in love with science we are doing this project on the great rift valley and this is really helpful thx. i love this picture where did you get it. I also came to this site through a Knowledge News link. I've been to Olduvai Gorge and experienced it's brutal heat and harsh terrain. This website offers a wonderful view of the region that can only be seen from satellite imagery. This website is great, very user friendly, and offers fatastic images. I came to this site because of an article in Knowledge News about the recent discovery in the Rift Valley of 3.3 million year old bones of a 3 year old child. I wante dto see what the Rift Valley looked lik and this was a great site for that. Very valuable. Thank you! Great views! I am going to show these to my students to demonstrate what a rift valley looks like. Thanks! showing 5 of 15 comments. Show all.